Monks Coffee Roasters is part of Amsterdam’s multi-cultural coffee scene. The owner, Patrick, is a lovely Irishman who opened Monks in 2016 after 26 years in Melbourne, bringing with him a very Australian coffee and brunch concept, Monks serving a combined breakfast and lunch menu until 2:30 in the afternoon, backed up by copious quantities of cake. When it comes to coffee, the name Monks Coffee Roasters is more aspirational than current reality, with the coffee toll-roasted by Bocca, another renowned name in Amsterdam speciality coffee. However, Patrick has a roaster on order and will soon be producing his own beans, supplemented by various guest roasters, including a guest espresso and multiple options on filter, with Monks offering V60, Kalita Wave, Aeropress, Chemex and French Press. You can have any bean via any method, but the staff have a default method for each bean. Monks has a modest store-front, but this hides a large interior which goes a long way back, offering multiple seating options from window-bars at the front to a large, communal table at the back. There’s even a shaded garden/yard at the back, but sadly objections from the neighbours mean you can’t have your coffee out there. 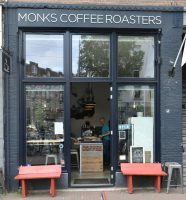 Monks Coffee Roasters is to the west of the centre, just north of the busy east-west artery of De Clercqstraat, making it very accessible on the city’s excellent tram network. Alternatively, it’s a pleasant 30-minute stroll along various canal banks. The modest store-front, a square, window-filled façade with a central glass door, hides a large interior. You can sit outside, a pair of benches flanking the door, or head inside, where the large counter is dead-ahead, running along the right-hand wall, facing left into the store. There’s a two-person window-bar to the left of the door, plus three stools at the front end of the counter. Given the size of the store-front, you would be forgiven for thinking that this is all there is to Monks, but the store goes a long way back. If it’s busy, secure a table, then return to order at the counter, where you can pay immediately or when you leave. Monks is a strange shape. Think of it as a rectangle, front facing the street, with the front, left-hand corner cut off. Or as a right-angled triangle, with one 45⁰ corner cut off at the front, with a long rectangular extension in the middle of the back wall. Either way, there’s a sloping left-hand wall at 45⁰ to the front, with a four-person bar, followed by a high wooden crate with a three-person bar along the front. The rest of the left-hand wall has an L-shaped padded yellow bench seat with four two-person tables which extends along the back wall where there’s another table. There’s another window back here, providing more natural light. The remaining seating is best considered as a rectangular block running front-to-back, starting level with the counter. There are five two-person tables, almost in a line, running from front-to-back, followed by, in a long, narrow extension at the back, a ten-person communal table. Finally, against the back wall, there’s a pair of high, two-person tables with stools, each under a tall, narrow window in the end wall. Monks is quite crowded, but the high ceilings and windows give it a sense of space even when it’s busy. It can also get quite loud, the whole café full of the sound of chatting people. Monks serves an extensive coffee menu with a house-blend and guest on espresso, plus at least four single-origins on filter, which change every six weeks or so. The pricing structure is very simple, with black (espresso) coffee at €2.50, white coffee at €3.00, and filter coffee at €4.00. The various beans are written on a roll of paper behind the door to the right as you enter. I was rather overwhelmed by the choice, so the barista said she’d surprise me. I was rewarded with a Colombian single-origin from Bocca, served in a carafe with a cup on side. A very smooth, rich and full-bodied coffee, it grew on me as it cooled. I paired this with lunch, selected from a menu which will be familiar to café-goers the world over, offering granola, avocado on toast, waffles, etc. I was very boring and went for the Eggs Florentine. This was exactly as it said in the menu: poached eggs on a bed of sautéed spinach, all on a generous helping of sour-dough toast, smothered in hollandaise sauce. And nothing else. In an era where people feel the need to pile stuff on their Eggs Benedict, etc, this was refreshingly simple. And very tasty too. For once I got somewhere before my friend Bex of Double Skinny Macchiato fame. You can see what she made of Monks when she visited in December. This entry was posted in Amsterdam, Breakfast, Cafe/Roaster, Cafes, Cake, Laptop Friendly, Lunch and tagged Amsterdam2018, Bocca, include by Brian Williams. Bookmark the permalink.